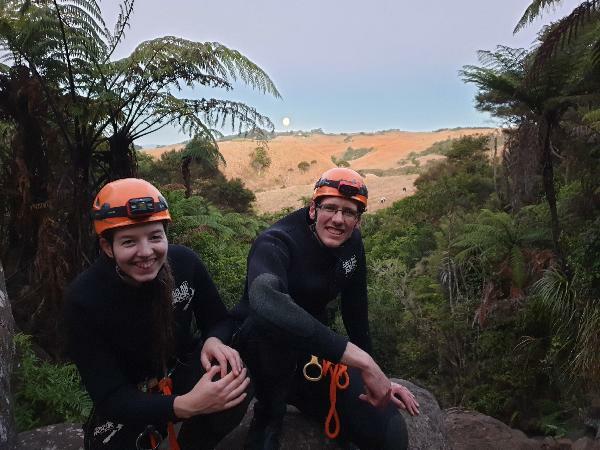 Abseil down waterfalls and navigate the canyon stream at night! Descend into the old fresh water canyon stream flowing down from Mt Karioi as night falls. You will be surrounded by picturesque scenery throughout the trip, all located on hidden Raglan farmland. This is a highly rated, truly magical canyoning experience. We encounter many obstacles on our way down, from waterfalls and rock walls to large boulders and deep rock pools. Challenge yourself to climb and abseil the cascading waterfalls and jump into the deep pools below! Although challenging, you will be accompanied by a very experienced, passionate and personable guide who is 100% safety audit certified, making sure all adventurers feel safe and get the most out of each and every trip. As we navigate our way downstream, we will reach the final waterfall which is home to thousands of twinkling glowworms. Cast your eyes around the rock face and revel in the magical luminescent display, before heading back to base to finish off an adventure to be remembered for a lifetime. The glowworm tour start time will change throughout the season due to sunset. This is a must do!!!!! Most real and authentic tour we have done so far on our trip. Highly recommend you do this tour it was unforgettable. Thanks for your review Ben! We agree with you there, we're very lucky to have such amazing nature right on our doorstop! Was a fun trip, lots of laughs. Highly recommend. Took two of my friends from America with me, one of them absolutely loved it & the other couldn't wait for it to be over but still said she was so glad we went. Well worth going whether you are from NZ or abroad. Last night we went on a canyoning trip with our guide Kevin(who also happens top be Dutch). It was a great experience. Good guidance and a lot of information during the trip. A little tea break with the magnificent sight of couple of hundred glowworms. An absolute must do If you are near Raglan. Your message has been sent to Night-time Glowworm Canyoning Adventure. You should hear from them shortly. Please note: all responses will come directly from Night-time Glowworm Canyoning Adventure, and not the team at Bookme.